Memoirs of a Stranger | Shahan Natalie Family Foundation, Inc.
“Only after the death of every single person who was involved in Operation Nemesis or would violently oppose the publication of its activities, may this top secret testimony be revealed to the world.” This was the behest of its author, Shahan Natalie, the mastermind of Operation Nemesis, which, in 1921-1922, was responsible for a series of unsanctioned executions of the principal perpetrators of the 1915-1923 Genocide of 1.5 million Armenians. Widely regarded as the President of the Writers’ Union of the Armenian Diaspora, Shahan Natalie, born Hagop Der-Hagopian, (1884-1983) has left a legacy of hundreds of unpublished pages of correspondence, essays, poems, short stories, plays, and diaries, including Memoirs of a Stranger. Written in 1922, it is Shahan Natalie’s voluminous first-hand account, detailing his search, discovery, tracking, and the eventual assassination of one of history’s most bloodthirsty dictators, Mehmet Talaat Pasha, the Grand Vizier of the Ottoman Empire. It is not just another testimony of an Armenian Genocide survivor, but rather, a detailed documentation by an Armenian national avenger. Following the Ottoman Empire’s defeat in World War I, the Turkish dictatorial triumvirate, Mehmet Talaat, Ismail Enver, and Ahmed Djemal pashas, fled to Germany, Ottoman Turkey’s close ally. 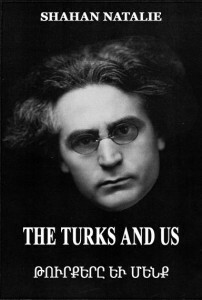 These Young Turks, the leaders of the once ruling Committee of Union and Progress (CUP) were tried in absentia and sentenced to death by the Ottoman courts-martial in Istanbul, on July 5, 1919, for organizing and implementing mass deportations and massacres of Armenians and other Christian minorities, forcing the Ottoman Empire into World War I, corruption, and other power abuses. Despite the verdict, however, these death sentences were never implemented. Mass protests of the CUP supporters, following the execution of minor officials implicated in the massacres of the Armenians, had startled the newly reinstated Sultan’s regime into inaction. Neither the Ottoman authorities nor the Allied government, made any attempts to seek out the most notorious of the war criminals and carry out the capital sentences. In the meantime, the three pashas were regrouping, on the loose, to discuss, among other issues, the possibilities of engineering the interrupted implementation of a crucial element of Pan-Turkism, the complete annihilation of the Armenian people. In view of the impotence of the Ottoman justice system, the issue of retribution against the principal organizers of the Armenian Genocide was included in the agenda of the month-long Ninth General Congress of the Armenian Revolutionary Federation (ARF), launched on September 27, 1919, in Yerevan. Having helped the same Young Turks come to power, the leadership of the ARF, the ruling party of the fledgling Armenian Republic, refused to take any action. Concerned by the advance of the Red Army, the ARF was, in fact, then considering aligning itself with the new Turkish authorities to stave off the Bolsheviks. As a result, the issue was tabled, to be revisited during the ARF Eleventh General Congress in 1923, after Armenia’s loss of independence. “Killing Talaat was the easiest thing if only we recognized him… Even his name had been changed,” recalled Natalie decades later in his home in Boston, MA. Fearing reprimand and retaliation, not only had Talaat changed his name, but also undergone plastic surgery to render himself unrecognizable. However, after months of thorough research and meticulous tracking, Shahan Natalie was able to identify him and document his daily routine in great detail. Soghomon Tehlirian, whom Nemesis had recruited to help him identify Talaat, was tasked to carry out the execution on March 15, 1921, in Berlin. In an unexpected turn of events, the German court acquitted the young avenger, having listened to his account of the Armenian Genocide and the massacre of his family. Notably, Raphael Lemkin, who later coined the term ‘genocide’, was present in the trials. Following ‘Number One,’ Operation Nemesis went after Djemal Pasha (July 21, 1922), and, a couple of weeks later, Enver Pasha (August 4, 1922). Almost 100 years later and decades after the last person involved in the Օperation passed away, Sylva Natalie Manoogian, PhD in Library and Information Science, Shahan Natalie’s daughter, is publishing the Memoirs of a Stranger. Written right after Talaat Pasha’s terminal assassination, Natalie’s fact-filled diary is a game-changing puzzle piece in the mosaic of Near Eastern history and, particularly, that of the Armenian people. 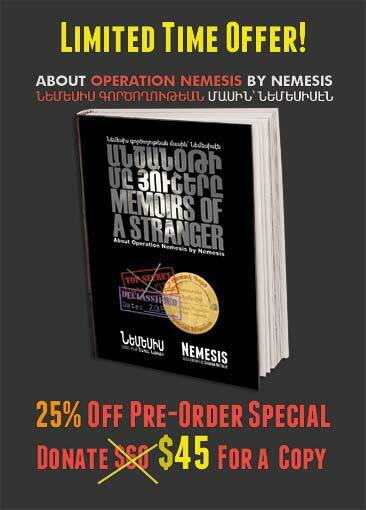 Memoirs of a Stranger is here to shed light onto the obscure corners of history and to undermine tall tales that have been flourishing thanks to its lasting silence. Apart from the Memoirs of a Stranger, this volume also includes a concise biography of Shahan Natalie; a summary of the 1919 trials that sentenced the CUP leaders to death in absentia; and the recollections about Shahan Natalie by Berjouhi Hovsepian, a Genocide survivor, and respected community leader.